The historic 1872 Isaac Wing House, with all modern amenities and conveniences, is located on First Street across from the Bayfield Harbor. 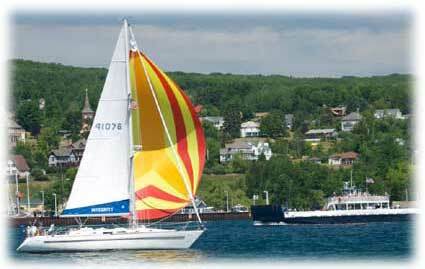 The House has four of five suites with picturesque views of Lake Superior and Madeline Island. Several spacious suites are perfect for families or groups. Beautiful sunrises can be watched from your suite, the deck, the gardens or the Park. Walk into an elegant entryway with rich colors and original hardwood floors and stairs. Each Suite has a private bath and air conditioning. All suites are air conditioned. Four of the five Suites have kitchettes which include a refrigerator, microwave, and coffeepot with beverage options. Wireless Internet access and cable television are available throughout the House. The House has a common sitting area located on the second floor which is a great place to gather with friends. The House is conveniently located to shopping, the Madeline Island Ferry Line, the Apostle Islands Cruise Service, city dock, restaurants and museums. The Isaac Wing House is managed by the Bayfield Inn. For rates and availability, call (800) 382-0995. The Big Top Chautauqua, www.bigtop.org, is a wonderful experience for kids and adults. Enjoy the incredible talents of local musicians and songwriters who have worked to create shows about the area and the Lake. The Big Top also hosts a variety of nationally known performers yearly. The Isaac Wing House is central to many activities Bayfield has to offer. To board a sailboat during Bayfield Race Week or Sailfest, an island cruise, or sailboat ride, theApostle Islands Marina and City Dock are only a few blocks away. The fishing dock and children's park are two blocks away from the House and bike rentals are just around the corner. The annual Festival of Arts is across the street in the City Park with the Lakeside Pavilion's activities just down the street. The orchards and berry farms are just minutes away. The fish shops are easy to locate from the House as well as the bathing beaches in the City. The Farmer's Market, held on Saturday mornings, is simply three blocks away. For those who enjoy walking, jogging, or biking, the Brownstone and Iron Bridge trails are nearby. Kayaks can be rented in town or launch your own, from several locations. Whether you choose to explore all the wonders of Bayfield and the area or quietly enjoy the Lake and gardens, the Isaac Wing House is here to accommodate your stay. Check the Bayfield.org site for events and details. There is always something to do in Bayfield, be it the shopping, berry picking, hiking, sailing, boating, swimming, music and shows, or festivals.